Plaid for lunch at Montana’s seemed appropriate. I’ve never put much thought towards the Montana’s BBQ & Bar restaurant chain. There are four locations that dot the south side of the city and two relatively close to my home. Yet, for some reason, they never really appealed to me. I’m going to chalk that up to the fact that I didn’t grow up going camping or lodging, so the very rustic cabin atmosphere didn’t seem to lend itself to the idea of a great meal out. However, my boyfriend had mentioned time and again to me that Montana’s makes some pretty good wings. Plus, I just happened to get a coupon in the mail. We ended up going to the South Edmonton Common branch for lunch on the August holiday Monday. We arrived just as they opened and one of the servers greeted us before she walked us to a booth nearby a few other customers. The interior of the South Edmonton Common Montana’s location. My first impression was that the joint was just as I imagined it would be. High ceilings with wooden beams (essentially wood everywhere), a stone fireplace, mounted animal heads, classic truck facades and a full-size canoe were among the decor choices I noticed. Crayons and kraft paper provide entertainment at the table. All of those things truly set a tone. Although, I don’t know that they scream barbecue. Either way, I didn’t actually mind it. The casual setting is great for a family outing, especially if one has children. We don’t have kids, but the kraft paper placemat that covered the entire table and the cup of crayons provided are arguably entertaining for adults as well. Going in, the only thing I knew we were ordering was a basket of the Double Dusted Chicken Wings ($13.79, but half price on Mondays). Otherwise, we had some decisions to make. Between the two of us, we finally settled on the lunchtime Reuben Sandwich ($15.99) and Mac ‘N Cheese ($11.99). The wings didn’t take long to make their way out from the kitchen. The reason why my boyfriend enjoys them so much is because there’s a lot of meat. I have to say that he was right. The wings themselves were larger than what might be found elsewhere. The only thing is that these orders only have eight wings each. Other restaurants often serve wings by weight and instead of eight wings, there might be ten to twelve instead. It balances out. Also, even with half price wings when we went, they still work out to be almost $7. Compare that to Tuesday night at Original Joe’s where a whole plate of wings comes to $4.50, and I’d probably be more inclined to go to the latter. In any case, I tend to prefer wings that are cooked with dry rubs, so these were quite messy. But, the texture was okay (still slightly crispy despite all the sauce) and the medium flavour was savoury, a little zesty and had a small kick of heat at the end. Reach dip also helped to tone down any spiciness, if needed. On a side note, I will commend Montana’s on their excellent sourcing of wet wipes, which are supplied to diners. They’re some of the best I’ve ever used. Moving along to our mains, my boyfriend is the one who chose the Reuben Sandwich. Smoked pastrami isn’t my favorite kind of meat. Yet, I’ll admit that it was quite good. I think it comes down to it being made in-house versus anything I’d get at the grocery deli. The meat was plentiful and succulent. Combined with mustard, thousand island dressing, sauerkraut and cheese, it proved more complex than I expected. Our main suggestion for improvement would be to grill the buttery marble rye a little longer to give the bread more texture and flavour. For his side, my boyfriend chose the chippers, which are fresh made potato chips sprinkled with dried dill seasoning and served with a dill dip. These were surprisingly good on their own. The potato slices were big, crunchy and non-greasy with a hint of the herb. Personally, I found the dip to be too strong, so I refrained from eating much of it. Both of our entrees actually showed up about half way through our devouring of the wings. The server even apologized that everything came out at the same time. It didn’t matter so much for the sandwich, but it would have been nice to get the Mac ‘N Cheese a while later. I wanted to finish the wings before they got cold, but it meant that I was delayed getting to my pasta. Thankfully, the macaroni and cheese came plated in a hot iron skillet. By the time I got to working on the dish, it could still be considered warm. I liked that Montana’s utilized cavatappi (corkscrew) pasta. The shape picked up more of the cheesy bacon and white wine cream sauce, locking in all the flavor. The whole thing was then baked with additional cheese until melted and golden brown. I do wish that there had been more crispy bacon tossed on top, but overall, this was a passable mac and cheese. If anything, this lunch-size version is a great value; included with the pasta is a side of Caesar salad (an appropriate amount of dressing for me) and in-house baked cornbread (sweet, moist, not too crumbly). The cost won’t break the bank and all three components of the meal are definitely filling enough. Now, we could certainly have skipped dessert that day, but the coupon I had on hand required a $40 purchase in order to receive a $10 discount, so we went for it. Montana’s provides several options in the sweets department. We ultimately decided on the classic Skillet Cookie ($6.99). First, I’ll say that it wasn’t quite what we were expecting. Our idea of a skillet dessert is that it’s made right in the pan itself. When the dish was delivered to our table, it looked like two already baked chocolate chip cookies had been sandwiched together with caramel in between and then placed into the skillet to be warmed. The dessert was then topped with a scoop of vanilla ice cream. I did find it to be very sweet and I tapped out before it was finished. However, it wasn’t bad by any means. The cookies were soft and chewy with lots of melted chocolate. The semi-sweet chocolate chips probably even aided in balancing things out with a touch of bitterness. So, is Montana’s BBQ & Bar going to be a place I visit regularly? Most likely not. Nevertheless, going forward, I won’t discount it either. Timing issues aside, the service we experienced was excellent at this particular spot, and the food, while not the best I’ve had, is of decent quality for the price. It used to be that I wanted to visit Chicago to see Oprah at one of her live show tapings. You never know. Maybe I would have walked away materially richer due to her famous giveaways. Alas, I didn’t have the chance to do that. Oprah has long since retired from her talk show, and, unlike New York City, there are few other internationally renowned hosts that film in Chicago. So, on my recent trip to the Windy City, celebrity and television were the last things on my mind. Instead, my parents and I set off from Edmonton, Alberta to Chicago for a week’s vacation. Staying in the downtown area, we were able to walk to all of the sights and attractions that we planned to see. Our days were filled with activity and the nights were relaxed. We lucked out with fantastic weather. Chicago lived up to the “Windy City” name (although, the moniker really is politically based) our first full day there with strong breezes and cooler temperatures, but it warmed up immensely, hitting highs in the mid-thirties (degrees centigrade). For those who have been to Chicago before, hopefully this brings back some great memories of your time there. If you haven’t been, perhaps this post will serve as a bit of a guide or a glimpse into what you can do (and eat) there. Enjoy! Our hotel room and view at The Godfrey. The exterior of The Godfrey Hotel at night. Situated centrally from everything on our itinerary, this River North hotel was the perfect home base for our trip. I will admit that things got off to a slightly rocky start though. While the hotel was accommodating in upgrading us to a room with two queen beds versus one king bed upon arrival, there was only the one unit available. Made to be handicap accessible, it really wasn’t the nicest of their rooms (and I have to say that the placement of certain items didn’t make sense in a room for the disabled). It was also on the fifth floor right next to the elevator, and we knew ahead of time that the lounge on the fourth floor of the hotel could get very noisy on the weekends (it seems to be a really popular spot for party goers), which is something we were hoping to avoid. Thankfully, the next morning, the hotel was able to switch us to a vacated room on the top floor of the hotel. With a beautiful view and much quieter surroundings, it ended up being a clean and comfortable respite from our adventures for the remainder of our holiday. Anyone who has read this blog knows how much I love food. Naturally, I tried to seek out a variety of offerings while in Chicago. Although I really wanted to try the food at Alinea – one of only two Michelin 3-star restaurants in the city and considered to be one of the top in the world – I couldn’t get a reservation, nor could I justify the cost when our Canadian dollar is doing so terribly. Therefore, rather than pre-planning our meals well in advance as I have in the past, we either attempted to search for whatever was best nearby whenever I was able to sign onto Wi-Fi, or we left it to chance. These are the places we tried. They’re listed in chronological order. Troquet’s French-inspired menu and atmosphere. Literally down the block from the Godfrey Hotel, we happened to catch Troquet on a particularly jovial evening. Live music was spilling out from the French-inspired restaurant out into the street and they had a sweet Wednesday night deal of a croque-monsieur and a bottle of Kronenbourg 1664 for just $12. Both my parents ordered the special and I actually went for a burger. French comfort food all the way, it was the atmosphere that really made this place seem like such a gem. With a piano pushed up near the open window and the performer celebrating his birthday, it was as if the pianist knew everyone there. Guests had prepared songs to sing and others walked around sharing chocolates from baskets that they had brought. It was a fun affair and a great way to start our first official hours in Chicago. The fast food version of Billy Goat Tavern & Grill at TheMART. This is the fast food version found at Merchandise Mart. I’m not one for onions or relish and stuff like that on my hot dogs, so I had a very simple polish dog on a sesame bun. It was juicy and flavourful without any condiments on it. I could have had another, no problem. Deep dish pizza at Labriola. Deep dish pizza joints are abundant in Chicago, and there are a few that tend to get mentioned. Yet, somehow we didn’t eat at Pizzeria Uno, Gino’s, Giordano’s or Lou Malnati’s. Rather, we found ourselves sauntering towards Navy Pier when we came across Labriola. Voted the best deep dish pizza in Chicago by ABC 7’s Hungry Hound, we figured it couldn’t hurt to try it. Warned that the pizzas take about 45 minutes to prepare and cook, we settled in for a bit of a wait. When the pizza arrived, it was piping hot, and there was cheese and toppings galore. We shared a 12-inch meat ball pie between the three of us, and I honestly wish that they came in smaller sizes. Delicious as it was, there was just too much. We left with a quarter of the pizza to go. The name really speaks for itself. If you enjoy doughnuts as much as I do and you also like fried chicken, you’re going to love the Erie Street location of Do-Rite. They had the best doughnuts I sampled during the trip and they have the gall to combine a fresh glazed doughnut with a breast of fried chicken, calling it the Sweet Heat sandwich. Even though a neighbouring diner was chastising one of her companions for ordering the same thing (she said it’s a heart attack waiting to happen), I don’t think you can walk into Do-Rite and not get one of those, right? The chicken was perfectly crisp on the outside and juicy on the inside; the glazed doughnut acting as the perfect shell with added kick from the spicy maple aioli. Awesome. We were told that the lounge on the 96th floor of the John Hancock building was a good way to get spectacular views of Chicago. The side we wound up sitting on allowed us to overlook the north side of the city. But, as it turns out, if you walk around the rest of the floor, you can get almost a 360 degree view. The women’s washroom even had huge windows that looked out towards Navy Pier and the east side of Chicago. As for the food, we didn’t have any. The drinks were fine, but extremely overpriced. Essentially, you’re paying for what you can see, not what you’re ingesting. Oh, my beloved Sprinkles. I do think that my love of a good doughnut has now surpassed my love of a good cupcake, but that doesn’t mean I’m going to pass up Sprinkles if I pass it by. It was a total fluke that we ended up across the street from the Sprinkles on Walton. I picked up one strawberry and one banana cupcake to go. Had I time to go back later in the trip, I would have. The receipt I got after my purchase had a 2-for-1 deal on it for Father’s Day weekend, and I’m kind of sad I didn’t take advantage of that. Mmmm, BBQ! Those fresh potato chips were amazing! Wandering around on night three, we had no idea what we felt like eating or where to go, but it was a Friday night and the streets all around us were bustling with activity. As we continued walking, we found ourselves on Dearborn street facing an adorable white brick building with a sign that simply said, “q.” After determining it to be a BBQ joint, we head inside and we were lucky enough to get a table in the lounge. What I liked most is that you’re offered complimentary pickles (not my thing) and fresh homemade potato chips (we had three bowls). The food was pretty fantastic as well. My dad said his pulled chicken sandwich was just so-so, but I loved all of the barbecue sauces that came with his meal. Both my mom and I ordered the mac and cheese with two meats – she got the brisket and pulled chicken and I ordered the brisket and pulled pork – and we were wowed by the portion size. We could have shared one skillet and it would have been plenty. However, I will say that the value is tremendous. A plain mac and cheese without any meat sells for $12, but for an extra $4, you get your choice of two meats, and they definitely don’t skimp out. I’d definitely recommend this place if you have a hearty appetite. Inside the Latinicity food hall. Pretty good tacos! Created by world-renowned Chef Richard Sandoval, this is essentially a glorified food court with a fancier name, but I actually really liked it. Every entrant is given a swipe card that can be used at any vendor within the hall. Whatever you order is recorded as data on the card. When you’re ready to leave Latinicity, the cashier will tally up your total and you pay right there at the exit. It works well, and the food was decent. The sushi vendor was questionable though. It’s nowhere near Latin-inspired and the rolls that my dad bought were not that fresh. However, the tacos I got were much better than expected and the pork al pastor had wonderful flavour that reminded me of what I usually eat at the best Mexican restaurant back home in Edmonton. It was also pretty quiet there for a Saturday (probably because it’s in the middle of the business district), but I enjoyed that it wasn’t crowded. Seafood paella at Cafe Iberico. This tapas restaurant was recommended to us by the Chicago Greeter that we were matched up with while on our trip. It was just a few blocks from our hotel. After a long day, we were starving and we decided to give it a go. The food was quite tasty. We did fill up on an awful lot of complimentary bread, but the beef skewers, mussels and the seafood paella were great. The paella was a particularly good deal as the portion size was large and there was plenty of seafood – squid, clams, mussels, scallops and shrimp – all cooked until perfectly tender. My only qualm is that we were seated in, what I’m guessing is, the lower-level of the restaurant just off to the side from the deli. It felt cramped and was extremely noisy. I assumed that was the only space in the restaurant, but when I Googled the restaurant later, I found numerous photos of a more open space with much better decor and high ceilings that would have felt much more comfortable, so consider that if you ever find yourself dining there. The fantastic food at The Vig and a hipster bartender to boot! Situated in the middle of Old Town, this was a bustling place to grab brunch on Father’s Day. It’s supposedly a sports parlour, but even with some TVs strategically placed around the space, The Vig managed to feel more elevated than that, likely owing to the 1950s style and decor. Fun touches like their drink “bible” (pages and pages of beer, wine and liquor listings) took it up another notch. The food wasn’t too shabby either. My dad decided to go a bit healthier that day and he opted for a salad. The veggies were piled high and the chicken was nicely seared. The whole dish tasted really fresh. My mom went for the skillet cinnamon bun, which was generously smothered with cream cheese icing. Because it wasn’t a high-rise bun, it didn’t quite have that fluffiness, but it still had that slight doughy quality that I like. I also dabbed some of that cream cheese frosting on my dish – chicken and waffles – to give the sweet side of my meal a twist over the usual maple syrup. The combo of the icing on my waffles with my juicy crisp chicken and their homemade hot sauce was spectacular. Our spread at Union Sushi + Barbeque Bar. Another completely last-minute choice while we were in Chicago, Union Sushi was a happy surprise. Located on the corner of Franklin and Erie Streets, the restaurant has a very urban vibe with concrete walls covered in colourful graffiti. The service was top notch with our server providing some great recommendations and the manager even providing a complementary ice cream sundae for my dad since it was Father’s Day. My parents and I ended up sharing a handful of dishes, including the truffled tuna, buffalo duck wing, uni alfredo soba, barbeque king crab legs and the pacific coast rolls. The rolls I could probably skip on another visit, but everything else was top notch. I liked that the dishes veered from the traditional and were a bit more adventurous. Before we left, I had to try some dessert and after a nudge from our server, I was sold on the pumpkin mochi cake. The cake itself really did have that sort of chewy consistency of a rice paste ball, but it was a bit more dense, and the combination of the cream cheese ice cream, caramel and pumpkin seed brittle was worth all the calories. The cool interior of Dolce Italian and our continental breakfast. The interior of the restaurant is quite nice and they also have a nice patio area outside. However, I would say that the breakfast menu is lacking somewhat. Although, I shouldn’t complain so much considering we didn’t have to pay for our meal here (this requires a long story about weird thumping sounds above our room that went on all night). We each ordered the continental breakfast, consisting of self-serve pastries, fruit plates, yogurt, granola and juices. For an additional cost we were able to add any of the main breakfast entrees. We all chose the smoked salmon, which was served with a side of tater tots. The salmon was really good, but minimal. If we had paid full price, I don’t think the few slices of smoked salmon would have been a good value at all. Service was also slow and inconsistent. It took a while for us to get any condiments at our table and when we asked for extra cream cheese, the server forgot about it. All-in-all, it was alright for free. Perhaps their brunch, lunch or dinner menus are better. Dinner at Niu Japanese Fusion. After a long afternoon of me wandering through the Art Institute of Chicago and my parents exploring The Loop, we were in need of some sustenance. While we were resting for a bit in the Hyatt Regency, I started searching for nearby restaurants on OpenTable. After flip flopping between a couple of choices, we finally decided to give Niu a go. Just a short walk away, this place had that mood-setting dim lighting inside, but it looked nicely decorated and it was busy. We perused the menu for a bit, and eventually we made up our minds. I placed our order and asked our server if he thought that would be enough to share. He said it would be plenty. To start off we got the classic spider rolls as well as one of their current feature rolls. Both were fresh and excellent, although I’d probably lean more towards the spider as my favourite of the two. We also shared a couple of noodle dishes, one a spicy seafood noodle soup and the other, pad Thai. Those were much larger portions than expected and we had no problem filling up with them. The best part is that the food came to the table nice and hot, which my mom definitely appreciated. Dessert was spectacular, too. The matcha creme brulee was good enough to rival my favourite from Japonais Bistro at home in Edmonton, and the black sesame ice cream is just something that isn’t very common in north America, so it was great to give that a try as well. I actually heard about Doughnut Vault at the beginning of the trip and I knew it was close to Merchandise Mart, but we missed passing it by on our first visit to MM, and it ended up being left to our last day. It’s a cute little shop with a blue door, a vintage cash register and a mail slot that welcomes both love letters and hate mail. Plus, they sell doughnuts. I’m the type that likes the really fun flavours and fillings that are starting to pop up at specialty doughnut shops. This place seems to go with the more traditional. We ended up getting an apple fritter, a blueberry glazed cake and an apricot jelly. The latter was by far my favourite (although, it was also the messiest) because the tartness of the jelly balanced the sweetness of the glaze, and the jelly helped to keep the doughnut moist. The blueberry glazed cake doughnut was okay, but I’m not typically a fan of the cake variety, anyway. I just thought I’d give it a try. The apple fritter was, honestly, a disappointment. It didn’t feel like it was soft or fresh enough. It had that greasy taste to the dough like they’d been left in the fryer too long, which is unfortunate. If it was fluffier, it could have been great, especially since they thought to dust them with powdered cinnamon, which I thought was a nice touch. Glazed and Infused doughnut shop. While we were sitting on the sidewalk patio of the Vault, another patron told us about Glazed and Infused, so when we entered Merchandise Mart, I immediately used their Wi-Fi to find out exactly where it was located. Not too far away, we figured we could make it there before our lunch reservations. I guess Glazed and Infused is actually known for their chocolate dipped long john doughnuts with a strip of bacon on top of it. That may be their signature, but I didn’t opt for it. Instead, I ordered the PB & J and the mango pineapple to go. I split the mango pineapple donut with my parents when we were waiting at Chicago O’Hare for our flight home, and it was good. The glaze actually had little bits of mango or pineapple mixed into it, so you got great bursts of flavour. The PB & J I saved for breakfast at work the next day. I probably should have eaten it when it was fresh though. The dough was already a little firmer and the glaze had sort of melted. It was decent, but nothing compared to Vancouver’s Lucky’s Doughnuts. Mercadito’s Mexican offerings and interior. I took to OpenTable to find a place where we could enjoy a last meal in Chicago. Mercadido fit the bill. It was within walking distance from our hotel and Merchandise Mart and it served Mexican fusion food, one of my favourites. Again, we shared all of the dishes, including the trio of guacamole (traditional, mango and beets), blackened swordfish tacos, mac and cheese and fried plantains. Of the guacamole, the beets was unexpected and so tasty. I wish I could have had more of it. I actually loved the tacos. The swordfish was nice and thick and the cabbage-jalapeno slaw with the spicy aioli was a great accompaniment. My only dismay with the dish is that there was, in fact, cilantro on it, even though it wasn’t mentioned in the description on the menu (other items did list cilantro, so why the inconsistency in the write-ups?). The mac and cheese was alright. However, I thought they could have sized that up a bit. For over $7, it was quite a small plate. I’ve never had fried plantains before, but these were awesome. I love bananas, and these were crispy on the outside, but not battered, which I appreciated, and the ginger-jalapeno sauce was the perfect dip. Check out all those doughnuts! We passed by Firecakes on our way to Mercadito from Glazed and Infused, and I wasn’t satisfied leaving Chicago without trying a doughnut from here, too. So, before we headed back to our hotel after lunch, we made a short pit stop. This shop was really cute and they had a lot of flavours to choose from (way more than Doughnut Vault). I glanced back and forth at all the doughnuts on display and the price of each and, although, some caught my eye, I wasn’t satisfied with the fact that, for almost the same price as the giant vanilla glazed doughnut, some of the other options were much smaller. There seemed to be very little consistency between the pricing and sizing of their products. I did eventually pick the coconut cream. Because of the way it was bagged, I made sure to eat that one as soon as we returned to our hotel room. When I bit into it, I was slightly taken aback. Turns out it was a cake doughnut, not a yeast doughnut as I expected. But, thankfully, it was a really moist and fluffy (not dense) cake doughnut and it was much better than I would have thought. Chicago is a city with a lot of history. In fact, it has two histories. The one before the Great Chicago Fire of 1871 and the one after. It’s known for it’s architecture and the river that runs through it, so there was a lot to see in a week and we managed to cover most of the main sights and attractions. Fun, interactive design at TheMART. A view from the second floor of TheMART. Another view from the second floor of TheMART. Merchandise Mart’s sign and the skyline reflected. I’m not sure what to call this. An underpass? It looks neat and we passed it on the way to TheMART. Looking up from the bottom floor of TheMART, this is what I saw above me. The mirrored ceiling of the second floor food court. This is an interesting building because it is open to the public and there are some neat designs for seating tucked throughout the main floor as well as some stores that are accessible to anyone. However, the majority of the building is relegated to professionals, so you’re not really able to see anything past the first and second stories. However, there are free design and architecture magazines galore, if you’re willing to carry them all. Still, it’s worth a visit. The building was created by Marshall Field & Co. back in the 1930s as a central marketplace for retail buyers, so it has a pretty long history in Chicago. There are so many bridges that span the Chicago river. You can even kayak in the Chicago river. One of many statues found in Chicago. Use can even use your smartphone to hear some of the history behind many of them. Okay, so we didn’t quite make it down to the riverwalk, which is quite expansive. But, we did follow the river on street-level and I was able to see quite a bit of the riverwalk below. The river goes right through much of the Chicago’s beautiful skyline, so combined with the water, their riverwalk is quite the sight. There is currently construction happening along some areas of the river where they’re expanding the riverwalk, so pedestrians can continue all the way down. It should be pretty great when everything is done. Our tour guide and some of the sites along the cruise. Wendella has been family-owned and operated since 1935. They claim to be the originators of Chicago’s architecture tour, and, if they are, they’re still doing a pretty fine job. We signed up for a river cruise on our first full day in the city (the coldest one during our week there), and for 75 minutes, I almost forgot about the chilly wind because our guide was just pumping out information and history non-stop. It was extremely educational and there were some amazing views of the Chicago’s skyline from a number of angles as we moved up and down the river. I’d highly recommend their tour. A tall ship decked out with pride flags at Navy Pier. The carousel at Navy Pier. I call this image “Bread.” This wasn’t actually at Navy Pier. I saw this on the way back to the hotel, but I don’t know where to place it. Celebrating it’s 100-year anniversary in 2016, Navy Pier was a must-see on this trip. There are some shops and restaurants as well as rental venues located at the pier. There is also the Children’s Museum as well as a few rides like the ferris wheel and the merry-go-round. The best thing about the pier is the spectacular views you’ll see of Chicago’s skyline and the water. If it wasn’t so cold out that second night in the city, it would have been a nice place to sit and stare out at the landscape. A park just off of the Magnificent Mile. An artist working on his pieces. I don’t remember which building this was in, but I’m pretty sure it was across from Sprinkles…almost certain. Crossing the overpass by Labriola at night. Spotted just off the Magnificent Mile. The best way to describe the Magnificent Mile is to liken it to NYC’s Fifth Avenue. It’s a 13-block street of high-end shops, most of which we skipped on this trip since it was never our intention to go on a spree. We did, however, walk this area often because it was usually busier than the streets that ran parallel, especially at night, and because many of the more well-known buildings that my dad wanted to see were situated just off the Mile. 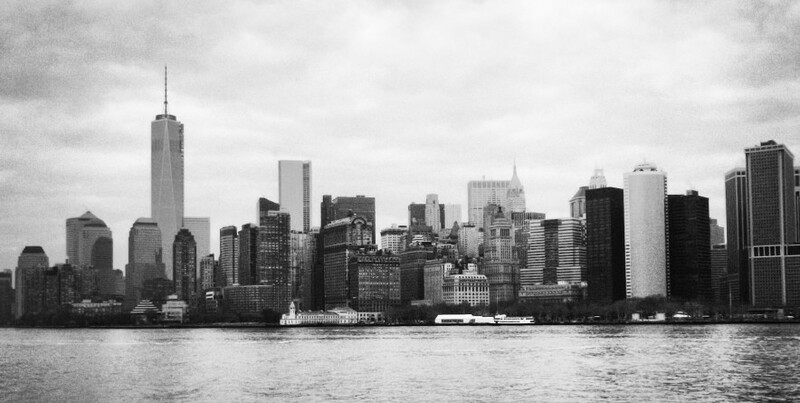 If you’re looking for some hustle and bustle, this is the place to be. The Museum of Contemporary Art’s program, including work by The Propeller Group. Seen at the Museum of Contemporary Art. Art created by patrons of the Museum of Contemporary Art. Such talent! This is one of the more affordable museums in Chicago and they seemed to have some interesting exhibits, so we decided to stop by and check it out. My favourite current exhibition is from The Propeller Group, which runs until November 13, 2016. Their pieces are tactile and visual and a couple have definitely stuck out in my mind after seeing them. Their short film, The Living Need Light, The Dead Need Music was especially enthralling. I’m not sure what’s the museum will be showing in the future, but it’s a decent one to visit if you have a couple of hours to kill. Passing by the Chicago Water Tower. One of the few buildings to survive the Great Chicago Fire of 1871, we really just passed this one by as we walked the Magnificent Mile. We simply viewed it from outside. But, I guess they actually have free exhibits inside the building, so it’s too bad didn’t realize that at the time. This is an iconic building in Chicago known for it’s striking industrial design. Mainly allocated for business use, it also houses the 360 Chicago observation deck and the Signature Room restaurant and lounge. Found these helpful gentlemen along State Street. Not sure what’s happening on that bridge, but there’s a crowd. The glass dome inside the Cultural Center, designed by Healy & Millet. One of the pieces being exhibited by Carlos Rolón/Dzine at the Cultural Center. An outdoor installation at the Cultural Center. Phyllis Bramson’s Under the Pleasure Dome exhibit at the Cultural Center. The full model of Chicago at the Architecture Foundation and lego models created at the LEGO Build Workshop. One of the uncovered tiled mosaics in the Marquette Building. Part of Marc Chagall’s mosaic mural, which our guide (pictured) took us to see. Pablo Picasso’s commissioned public sculpture. The Chicago Cultural Center was previously known as the first Chicago Public Library. Even though the facade of the building still hints towards its history, its purpose has changed immensely since it was completed in 1897. Prior to it being established as the nation’s first and most comprehensive free municipal cultural venue in 1991, it was actually sitting neglected before it was named a city landmark and the space was restored. Now, it’s home to rotating exhibits and performances throughout the year, and you can still see the world’s largest Tiffany stained-glass dome on the south side of the building as well as another renaissance patterned glass dome designed by Healy & Millet on the north side of the building. Chicago Greeter also has a desk in the lobby of the building for last-minute InstaGreeter tours around The Loop and Millennium Park. We pre-registered for a Chicago Greeter tour prior to arriving in the the city, so we were paired with a guide who asked us about some of our interests and she created a 2-hour tour of public art (Did you know that Marc Chagall created a mosaic mural or that Pablo Picasso designed a giant metal sculpture for the city? Or, that inside the Marquette Building lay hidden for years some gorgeous mosaic tiled murals?) around Millennium Park and The Loop for us. Located inside Block 37 on the 3rd floor is the Chicago Design Museum. Limited-engagement exhibitions rotate through the small space. The one we happened upon is called Unfolded: Made with Paper and it is running until the end of July 2016. Some of the opulence found in The Palmer House Hilton. A famous and historic hotel in Chicago’s Loop. This is a lavish building that has been built and rebuilt on the same site three times. With intricate details and design, it’s considered to be another iconic Chicago landmark. It had been a long day by the time we made it to Grant Park, so we pretty much just went straight for Buckingham Fountain. At first we were worried we wouldn’t get close to the fountain since there was some sort of craft beer festival taking place on the grounds, but once we circled around all of those tents, we managed to see the famous fountain. It’s definitely pretty, especially with the skyline behind it. Sitting on the benches that surround the park made for a lovely view. The giant rock climbing wall. Created as a kids park, I think it is equally enticing for adults. Granted, we didn’t quite venture far enough into it to be overwhelmed by children, but it’s pretty sprawling with lots of green grass and a giant rock climbing wall. It also links, by bridge, to Millennium Park. Outside and under The Bean. The orchestra playing the Grant Park Music Festival at the Jay Pritzker Pavilion. Kids playing in Crown Fountain. This is where you’ll find the famous Bean (a.k.a. Cloud Gate) and Crown Fountain. It’s also home to the Jay Pritzker Pavilion (designed by Canadian-born architect Frank Gehry), which played host to the Grant Park Music Festival and Flight of the Conchords while we were there. Unfortunately, I did not get to enjoy the latter, but it is a fantastic outdoor venue that reminded me of a more upscale version of the concert pavilion in Hawrelak Park in Edmonton. Last, but not least, was Lurie Garden, a 5-acre space that pays tribute to Chicago’s marshy origins. I quite enjoyed walking through Old Town Chicago. Of course, it’s now full of fun independent stores, coffee shops and eateries, but it still has some of that historic vibe going on. Strolling down the main street of Old Town, plaques will become apparent. Stop and read them to learn more about the area and what efforts the city is making to revitalize the neighbourhood. Outside the Chicago History Museum. Well wishes for Orlando after the shootings there. The entry of the museum. We popped inside this building to take a peek, but we didn’t pay the entrance to go through the whole thing. What I was able to see in the front entrance, I liked, and I suspect it would be a really interesting museum to poke around. There was also an excellent cafe-style space that was accessible to the public called Chicago Authored. It’s a multimedia-based gallery with a crowd-sourced collection of works by writers from the past, present and future that define the character of Chicago. Patrons are asked to bookmark pages that they feel speak to their idea of Chicago and to also fill out postcards about their Chicago experience. It was fun and interactive. The museum also has a cute little gift shop where I found a great pair of glass earrings, which I saw at another store later on for almost double the price. A statue of Abraham Lincoln. A black-crowned night heron. These trees were filled with them and their nests. Ducks spotted in the water along the boardwalk in Lincoln Park. A pretty view in Lincoln Park. Another gorgeous view of the city in Lincoln Park. Zoo patrons taking a rest on a scorching hot day. The lion is napping in the shade. This combo makes me laugh. He just looks so beat in the second picture. A musician entertaining in the zoo. Inside the conservatory. We made it there just before closing. The conservatory’s pretty glass building. Look at the rainbow by the fountain. A fountain in Lincoln Park. It was scorching hot when we decided to wander through Lincoln Park, but it’s very picturesque, and if you follow along the boardwalk, it will eventually lead you to the Lincoln Park Zoo and the Lincoln Park Conservatory (both free for everyone all year-round). Do they really still serve Shamrock Shakes in June? The exterior of Rock N Roll McD’s and some of the memorabilia upstairs. We passed this McDonald’s by numerous times during our trip. It was located just a couple of blocks from our hotel and you really cannot miss it. Considered as one of the flagship McD’s, it’s a large, 2-story building with the top floor created using floor to ceiling windows and a 360 degree view of its surroundings. The rear half of the second floor also has a museum with memorabilia that dates back to the 1950s and spans all of the following decades since. Each section of the restaurant directly next to that decade’s display is decorated to look like that time period. A $1,000,000 cube of $1 bills and I’m really good at picking out real currency vs. counterfeit. A small, but interactive museum, my dad loved it. It’s all to do with American currency and its history. There are various iterations of $1,000,000 throughout the museum, so you can imagine what it’d be like to have all that money in your account, and you can even leave with about $370 US in cash (shredded, of course). NOTE: To enter the museum, you will be led by security through a metal detector and your bags will be checked. Photos can be taken once inside the museum, but not within the lobby of the Federal Reserve building. I fondly call the lions in NYC the Library Lions. I’m not sure what to call these ones at The Art Institute. A tucked away park by the Art Institute. A chess/checkers table set up outside the Art Institute. Crossing the street towards the Art Institute. Just past the entrance of the Art Institute, you’ll find the stairways that will lead you to the European galleries. Ladies (guides, students, writers?) working on some sort of project in one of the galleries. The Eruption of Vesuvius by Jacques-Antoine Volaire. Short Circuit (Combine Painting) by Robert Rauschenberg. Golden Wings Brushing the Clouds Incarnated from Earthly Wide Star by Chikatsusei Maunkinshi. The Ryerson & Burnham Libraries housed inside the Art Institute. Honey Bee Swarm with Flowers and Fruit by Paul Stankard (Paperweight). Founded in 1879, this is one of the oldest and largest art museums in the United States. This was the last major attraction I saw on this trip, and I spent over four hours perusing the museum’s galleries. Having been to The Met in NYC and The Louvre in Paris, it’s difficult to say which is the best. They all have their strengths. At the Art Institute, they really do have an amazing collection of impressionist artwork though. There was also a great temporary exhibition of American Art in the 1930s. I snapped many photos of pieces I wanted to remember as I walked through the whole museum as a lot of them spoke to me or intrigued me. The Thorne Miniature Rooms collection was also quite fascinating for the novelty of it. A butterfly spotted on the walk to Union Sushi. Commissioned sculptures that greet visitors to the Felix hotel, right next door to The Godfrey. Just sleeping on the street. No big deal. Walking around The Loop, heading towards the Chicago Cultural Center. It’s like the homeless man knows I’m taking a photo of him. The Chase building. Pretty ordinary except for the moving spirals. Overall, Chicago turned out to be a wonderful city. Sure, it can be gritty and the streets are populated by a lot of homeless beings, but the people we came in contact with were often friendly and helpful, and we had no problem filling our days. However, should I ever go back to Chicago, there’s still plenty left for me to see and do. I didn’t make it to the Adler Planetarium or to Wrigley Field. Granted, I’m not much of a baseball fan. Hockey is more my thing. Maybe next time I can see a Chicago Blackhawks game. My boyfriend would probably like that, especially if they’re playing against his team, the Pittsburgh Penguins. Like the High Line in NYC (one of my favourite places in that city), the 606 is an elevated urban park that combines public art, bike trails and landscape design while connecting a number of trendy neighbourhoods. It’d be interesting to compare the two. Plus, there are definitely more doughnut shops for me to visit. For the time being, I’ll have to be content with this first experience, and, don’t worry, I certainly am. I’m just always thinking ahead. So, until next time! 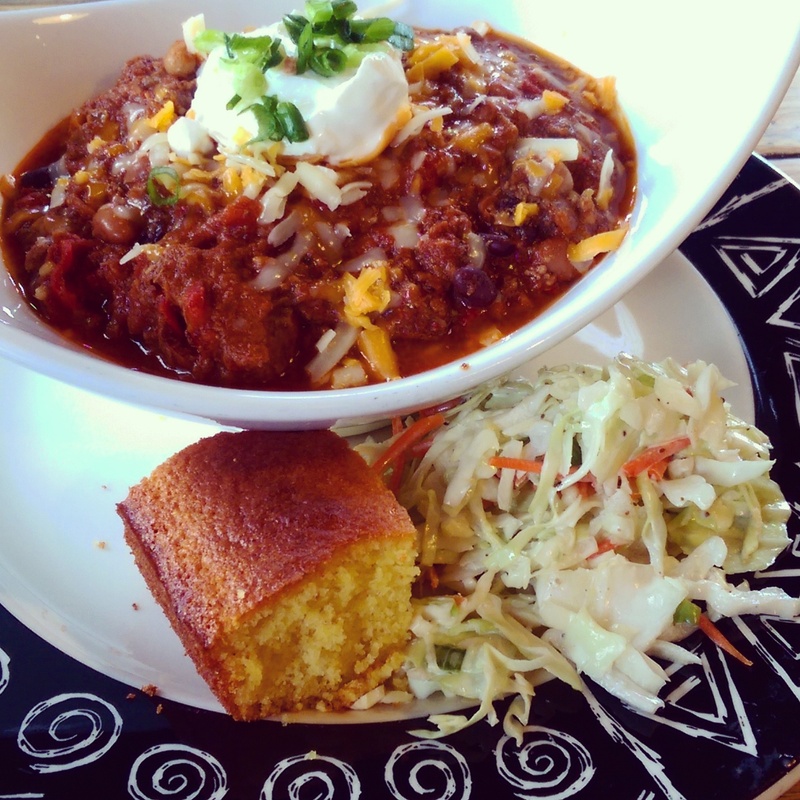 My dad’s Brisket & Buffalo Chili with cornbread at Sloppy Hoggs. I have actually mentioned Sloppy Hoggs Roed Hus in a previous review about their now closed sister restaurant Absolutely Edibles (AE’s). I’m still not entirely sure why AE’s shuttered its doors after 19 years both serving and catering food – perhaps it was an expired lease – but I’ll miss it. Judging by the updated website, they still do catering. Out of which location, I can’t be certain, yet the good news is that Sloppy Hoggs is still open for business. They even carried over the AE’s brunch menu, albeit with a minor change or two. Sloppy Hoggs itself is geared more towards Southern style cuisine, so the look of the restaurant consists of many large booths – perfect for the communal-like atmosphere reminiscent of a friendly barbecue – that can fit between six to eight people. The tables at the center of the space can be reconfigured to accommodate larger parties as well. I quite like it. It’s nice and sunny inside due to the large windows, it’s clean, and the booths are comfortable. The bar and the large booths at Sloppy Hoggs. It definitely has a country feel. Part of the Sloppy Hoggs Roed Hus menu. Also available at AE’s. The entrance of Sloppy Hoggs Roed Hus. When it comes to the menu, the food is very much of the hearty variety. Items such as jambalaya, beans & rice, chicken & waffles, BBQ chicken, pulled pork and wild sausage pepper the list. However, it should comes as no surprise to anyone who has been following my previous posts that I love mac and cheese. No question, it’s one of my favourite dishes. It’s delicious and the concept is simple, but if not executed properly, it can really be a disappointment. Therefore, when I saw the choice of mac & brisket, I had to find out for myself if it was up to snuff. My dad joined me on this first outing to the restaurant last year, opting for the brisket & buffalo chili. My first observation when the food arrived was that the portions were quite large. The bowl of chili that my dad ate could probably have fed two people. I sampled a bite of the slow-simmered mix of beef brisket, buffalo, beans and veggies and was glad to see that the consistency of the dish didn’t come out as a pile of glop. There were various textures evident in the chili, which I liked. The beef brisket was nice and succulent. Cheddar cheese and sour cream helped to cool the flavour down a bit, too. The only problem with this order was that the chili wasn’t served at a hot enough temperature. We asked that the server return it to the kitchen to be reheated. When it came back to the table, it was so hot that steam was rising from the bowl. The chili also came with a side of my dad’s choice. He decided on the corn bread. It was more crumbly than I would prefer, but it tasted great. My Mac & Brisket at Sloppy Hoggs. So good! The mac and cheese half of my mac & brisket dish started off a little underwhelming. On the menu, it’s described as a creamy pasta infused with bacon and jalapeno, and while it was a smooth cheesy sauce (baked over with extra cheddar! ), the added flavour profiles didn’t really come through at first. It turns out that I just needed to stir it up, so that everything was more properly distributed (so much for working my way across the plate in an orderly fashion). Once the spiciness and smokiness from the jalapeno and bacon started hit my taste buds, I changed my mind about this selection. 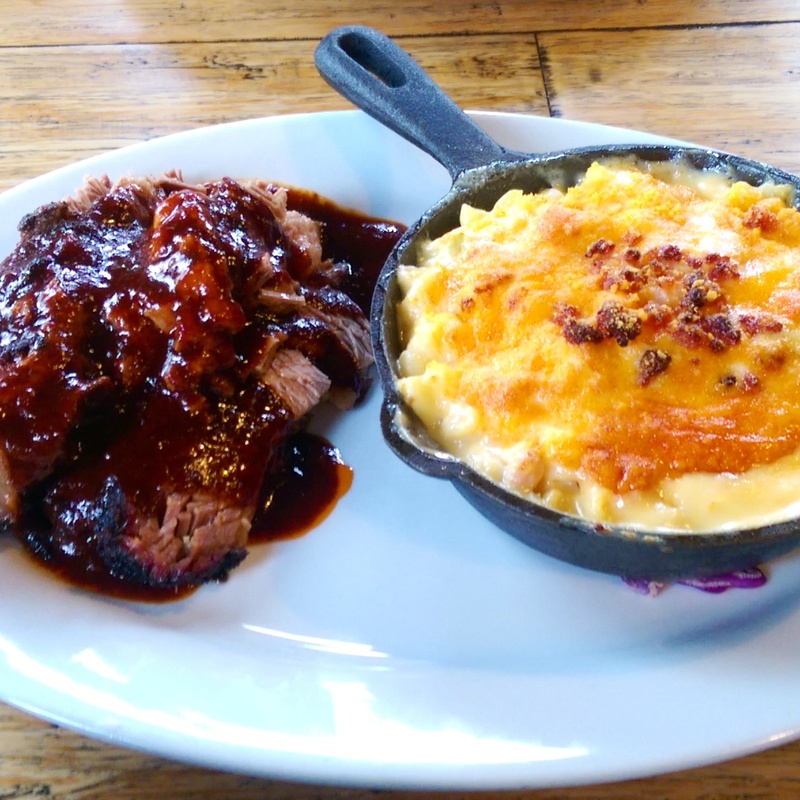 The ten ounces of slow-smoked brisket was the perfect compliment to the skillet of mac and cheese; the tender beef was generously coated with barbeque sauce that played well with the rest of the ingredients. The service we received was excellent and the amount of food for the price was justified. As a result, based on that one occasion, I was inclined to go back again. As it happens, I was pushed to do so sooner than I planned and rather unexpectedly. I still had a Groupon in my possession for the aforementioned Absolutely Edibles when they closed. Thankfully, they chose to transfer any unused vouchers over to Sloppy Hoggs instead, hence my second trip to the restaurant earlier this year. This is when I found out that they were offering the old brunch menu from AE’s on the weekends. Maybe they always served those brunch items in the past, but I’m not able to verify that. All I know is that I can still get the waffles with the works or the pulled pork waffle (see my previous AE’s review), and that makes me happy. The one major difference I made note of between their latest iteration of these brunch dishes and the ones that were previously available at AE’s is that they no longer seem to come with those fantastic sweet potato fries. Those have now been substituted with regular hash browns. Granted, I’m okay with that. The small cubes of pan fried potato were crisp on the outside and soft on the inside, and made even more delicious when smothered with tangy ketchup. I was too full to eat any more, but I couldn’t stop until the plate was taken away from me. You’ll probably have a hard time stopping, too. Serving customers and offering catering since 1999, Absolutely Edibles (a.k.a. AE’s on 118th) took a chance by opening their business in what has long been considered a crumbling neighbourhood. They must have known in their gut that it was the right move though. Within the last few years, 118 Avenue has continued to improve with a number of entrepreneurs opting to set up shop along the previously notorious street. A commitment to healthily prepared foods – creating dishes from scratch with fresh, local and Canadian products where possible – I wasn’t fully aware of the establishment until I truly began delving into the Edmonton restaurant scene this past January. Around for 15 years now, it had eluded me, but I finally decided to venture towards the unknown (as many of us are not apt to do, preferring to stick to the tried and true) because – say it with me now! – I had a Groupon to use. A view of the small restaurant. The right side of the establishment. Tables tucked in the corner. Brick walls and mosaic tables give this place a chalet-like feel. When you drive up to the building, it’s unassuming and small. There is a cute patio space filled with tables and umbrellas that shade from the sun on hot summer days. The interior seats only about 30 people; the decor of slate brick walls, mosaic tiled table tops, a mix of red, green and brown leather upholstered chairs and beige tiled floors, which all look recently updated or, at the very least, well kept, giving the space both a modern and slightly ski chalet-like vibe. It was a quiet Saturday afternoon when my parents and I stopped by for lunch, so we had our pick of spots as well as excellently attentive service from Ryan, the lone front of house staff member that day. On first impression, I was happy to see that the eatery was not only stylish, but impeccably clean. My second impression was that their menu was completely overwhelming. On weekends, I assume, you receive both their brunch and lunch menus. Plus, you also have the option to order from their sister restaurant, Sloppy Hoggs Roed Hus, which is located in the adjacent building (perhaps somehow sharing a kitchen). Each list was extensive, taking full advantage of the word “fusion” as used in the establishment’s full name. Menu options pull from various influences that run the gamut from Asian (dim sum) to Southern (jambalaya) cuisines. As I found it difficult to concentrate on all the possibilities, I decided to ask Ryan what his recommendations were. Ultimately, I went with the Pulled Pork Waffles, my mom chose the Waffles with the Works and my dad ordered the AE’s Classic Club. What Absolutely Edibles lacks in terms of physical space, they certainly make up for when it comes to portion sizes! The plates, especially the two from the brunch menu, were brimming with food enough to feed at least two people each. My dad raved about the Chicken Cacciatore Soup that came as a side to his sandwich. The tomato-based soup looked incredibly rich, thick and full of chicken and veggies, and the sandwich’s focaccia bread was stacked high with three meats – bacon, turkey and slow roasted ham – cheddar and mozzarella cheese, lettuce, tomato and mayo. My dad’s AE’s Classic sandwich with Chicken Cacciatore soup. 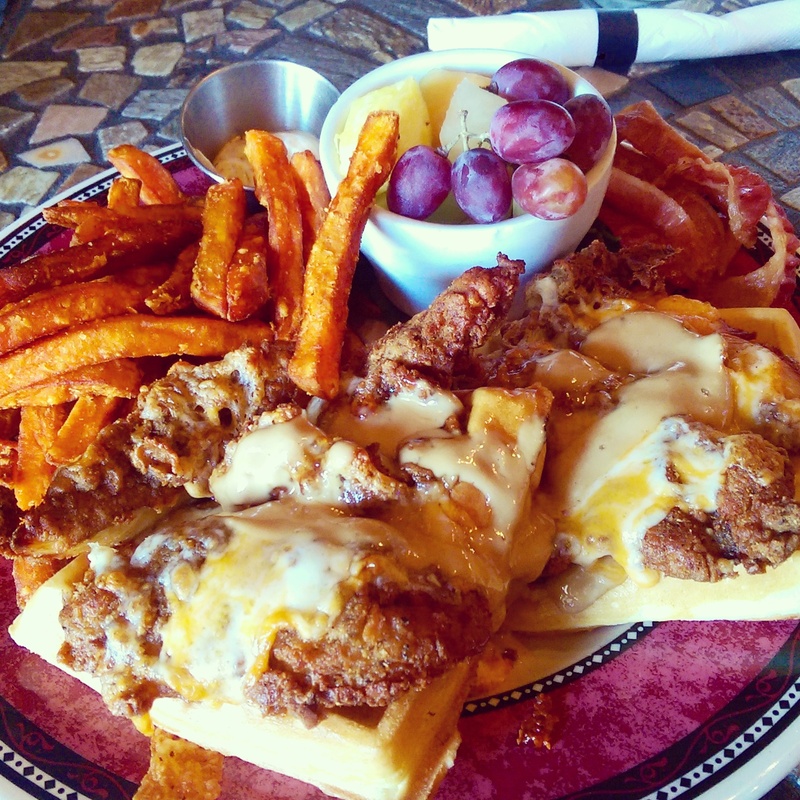 The Waffles with the Works was a compilation of two Belgian waffles topped with fried chicken, bacon, cheddar and mozzarella and then drizzled with a spicy maple cream. I tried a couple of bites out of the approximately four or five large pieces of chicken and was met with a crispy, juicy, but not greasy meat. I couldn’t really tell that the maple cream was spicy; however, I always enjoy a mix of savoury and sweet profiles. Pulled pork has become one of my preferred foods to eat when I see it on a menu (probably because I never make it at home), so I couldn’t pass up the Pulled Pork Waffles. The pork is smoked in-house and layered with the same spicy maple sauce, bacon and cheddar and mozzarella as my mom’s dish. It’s then finished off with a “blendmore” waffle sauce, two sunny side up eggs and a bit of maple syrup. If indulgent is what you want, that is exactly what you’ll get when you dine at AE’s. The only downfall of an otherwise fantastic dish was that the sauce smothered pull pork made the waffles soggy fairly quickly. Therefore, instead of having crisp and airy waffles, it became more like a mush with amazingly tasty shredded meat. Next time, instead of leaving everything piled directly on my waffles while I dine, I’ll probably shove everything to the side to avoid that. The two waffle plates also came with large sides of sweet potato fries (the Works was supposed to be covered in cinnamon sugar, but it didn’t taste like it), some aioli for dipping as well as a cup of fruit (this wasn’t mentioned on the menu). A positive outcome of eating here is that for about $55 for three people (tax and tip included, no drinks), you will not only leave completely full, but you’ll also likely have leftovers to last you at least one more meal. In less than two hours, Absolutely Edibles became my father’s new favourite restaurant. He has even gone back twice more with different friends who were all equally impressed. I think this is where the establishment has found its success – word of mouth recommendations from trusted friends and family. I know I would not only tell people to go, but I’d make sure that they bring me with them whenever they do! If you have a chance, I suggest that you also check out Sloppy Hoggs Roed Hus, situated around the corner, because the food is just as good and the portion sizes are equally as generous. It’s also a great place for larger groups as most of the tables can seat about 6 to 8 people, maybe even more. The service is top notch, too.